Links to this page can be found in Book 3, Map B3, Day 1, View C10, Rione Campitelli and Rione Monti. 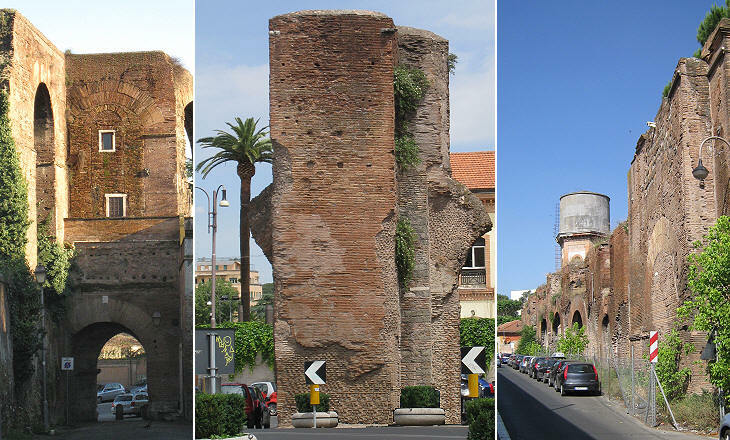 This plate shows monuments belonging to different periods of the history of Rome: a pillar of an ancient aqueduct (Aqua Claudia), an Early Christian church (S. Stefano Rotondo), a series of medieval buildings (Hospital of S. Tommaso in formis) and the Renaissance façade of S. Maria in Dominica. This last-mentioned church gives the name to the plate, but at Vasi's time it was best known as S. Maria alla Navicella because of a small sculpture depicting an ancient ship which stood in front of it. The view is taken from the green dot in the small 1748 map below. 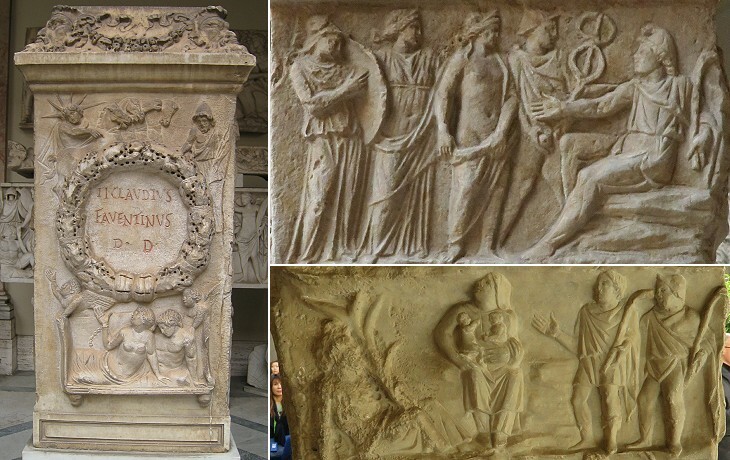 In the description below the plate Vasi made reference to: 1) S. Stefano Rotondo; 2) Ruins of Acqua Claudia; 3) Entrance to Villa Mattei; 4) S. Maria in Dominica (or Domnica), a corruption of Latin Domini which means "of the Lord"; 5) S. Tommaso in formis; 6) Ancient inscription on Arco di Dolabella. The small map shows also: 7) La Navicella; 8) Villa Casali. The dotted line in the small map delineates the border between Rione Campitelli and Rione Monti (lower right quarter). This part of the Caelian Hill has retained all its historical monuments, but it is no longer an out-of-the-way location as it was in the XVIIIth century. It is now crossed by a large street linking Colosseo with Porta Metronia. Villa Casali, an estate which stood near S. Stefano Rotondo, was demolished in 1885-891 to make room for a large military hospital. Navicella means little ship and the monument is a copy of a Roman sculpture which was found in the area. It was made in 1513 by order of Pope Leo X (a yoke, one of the heraldic symbols of the Pope can be seen on the bow). In 1931 its location and orientation were changed; it was perpendicular to the left side of the church and it became parallel to the central arch of the portico; in addition it was turned into a fountain. 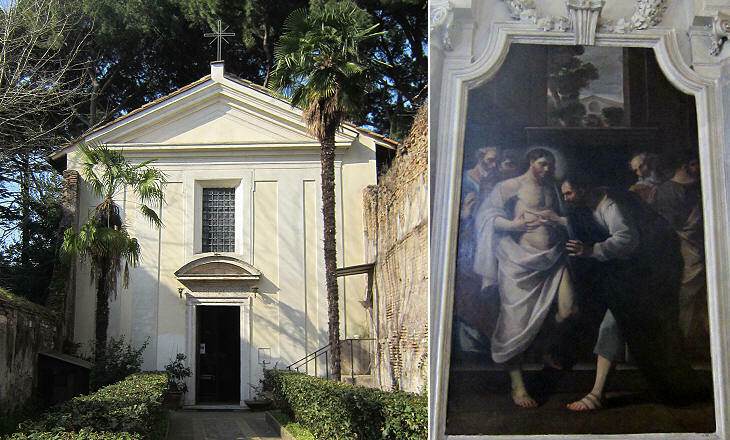 S. Maria in Dominica is one of the oldest churches of Rome and it is recorded in a 499 chronicle. It was redesigned by Pope Paschal I in 817. The portico was built during the pontificate of Pope Innocent VIII at the initiative of Cardinal Giovanni de' Medici . He was a son of Lorenzo de' Medici, the de-facto ruler of Florence. At the request of his father he was created cardinal in March 1489 and he was assigned to S. Maria in Dominica, but he was prohibited from wearing the cardinal red hat and ring for three years because of his young age, as he was thirteen years and four months old at the time. In 1513 Cardinal Giovanni de' Medici became Pope Leo X and he added his papal coat of arms and several heraldic symbols of his family in various parts of the church (the lion heads on the arches of the portico - image used as background for this page - were a symbol of the Pope). Three ostrich feathers, very similar to those in the emblem of the Prince of Wales, were another of his heraldic symbols. One of his mottoes was (Jugum Christi) Semper Suave (Jesus Christ's Yoke is Always Sweet). 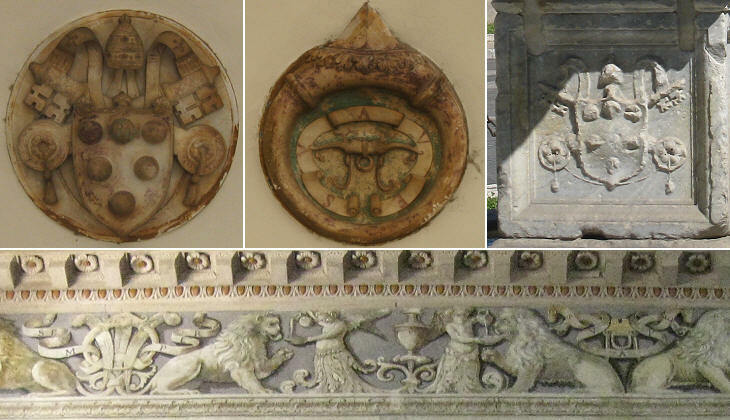 Other heraldic symbols can be seen in palaces he had in Rome (e.g. Palazzo Medici Lante and Palazzo Madama). 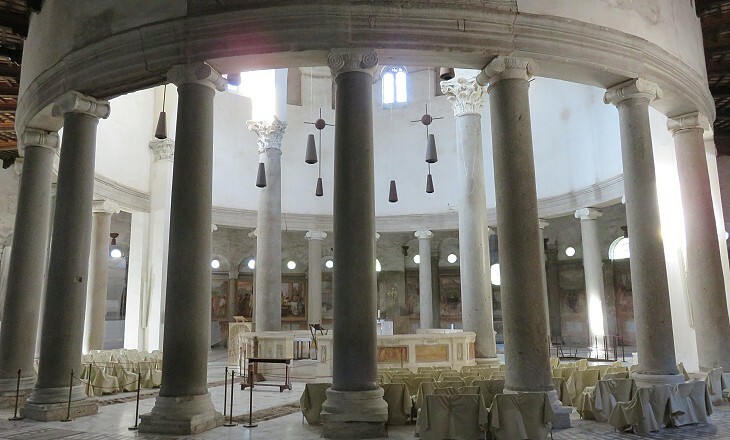 The interior retains its IXth century layout which was based on that of an ancient Roman basilica: a rectangular hall divided into three naves by rows of columns and with an apse at its end. The columns and the capitals were taken from ancient buildings. 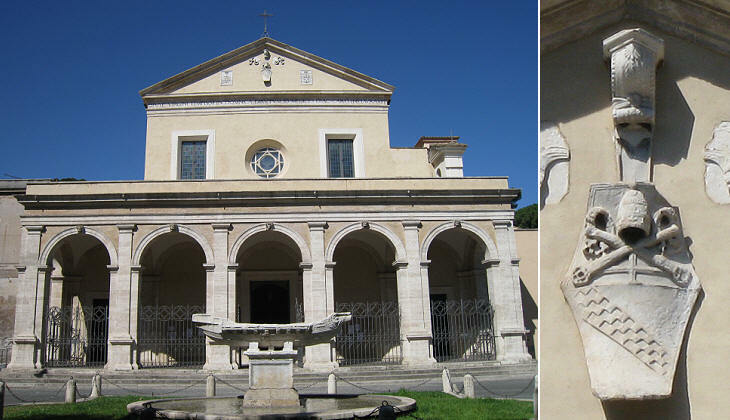 At the beginning of the XVIth century Andrea Sansovino repaired the church: the capitals with lotus leaves are perhaps a work by him, as they were very popular at the time (you may wish to see a similar ancient capital at Villa Adriana and a Renaissance one at S. Maria Porta Paradisi). 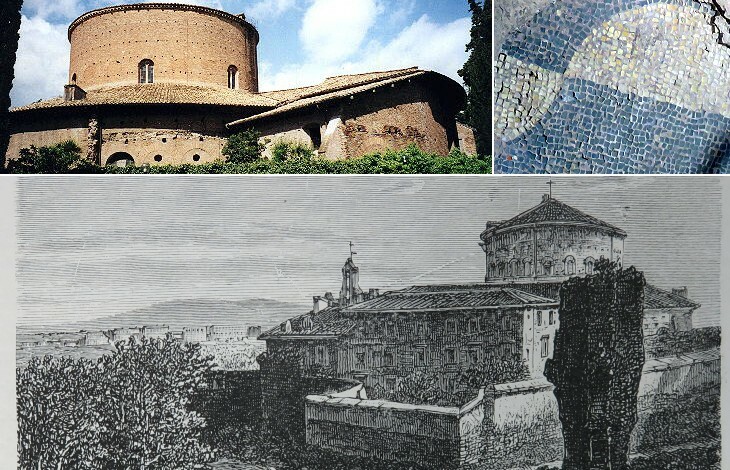 The mosaic inside the apse is shown in a page on some of the finest mosaics of Rome. 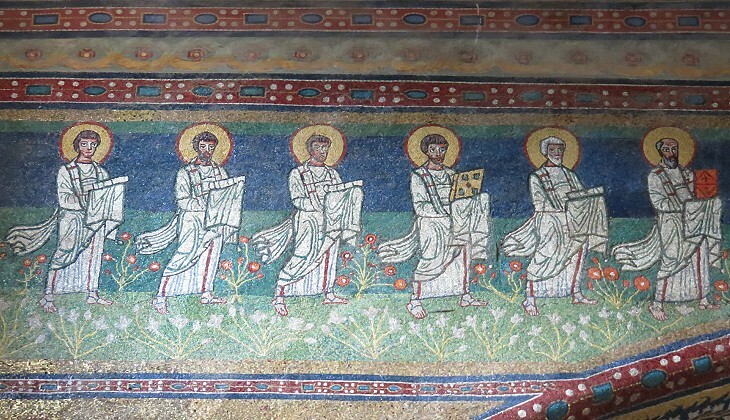 Processions of saints were often portrayed in Early Christian mosaics. Keeping on with a very strong tradition in portraiture, the unknown author of this mosaic differentiated the faces of the saints, rather than depicting iconic images of them: the first two on the right are most likely St. Peter and St. Paul. You may wish to see other mosaics depicting processions of saints at S. Apollinare Nuovo in Ravenna. Pope Paschal I restored and embellished with mosaics two other churches: S. Cecilia and S. Prassede. 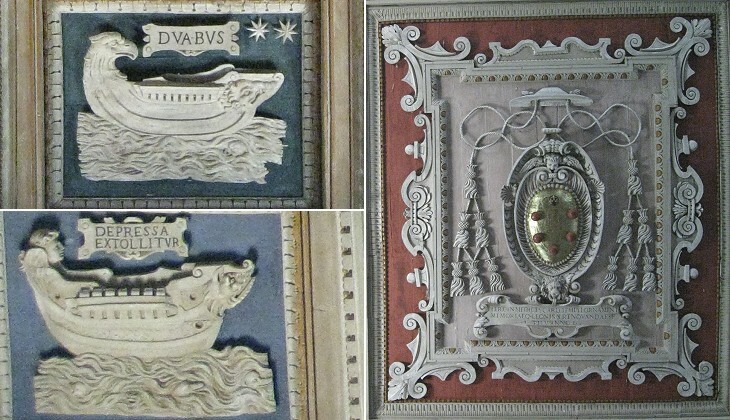 The theme of the little ship appears again in the beautiful late Renaissance wooden ceiling of the church, which was built by another Cardinal de' Medici in 1566. Ferdinando de' Medici was created cardinal in 1563 at the age of fourteen and he was assigned to S. Maria in Dominica. He most likely expected to become Pope, but after having attended three conclaves without success he gave up his ecclesiastical career. In 1587, at the news of the rather mysterious death of his brother Francesco, he precipitously left his palace and his villa in Rome to rush to Florence. He became Grand Duke of Tuscany and in 1589 he married Christina of Lorraine. You may wish to see his equestrian statue in Piazza della SS. Annunziata in Florence. The XIIIth century buildings shown above were part of a complex (hospital, monastery and church) belonging to the Trinitarian Order. The elegant portal is a work by Jacopo di Lorenzo and his son Cosma who also designed the portico of the Cathedral of Civita Castellana. The latter gave his name to the Cosmati work, a type of decoration based on the use of pieces of ancient marbles. In 1379 the Trinitarians left the hospital and the monastery; in the XVIIth century they built S. Carlo alle Quattro Fontane and in the next century Chiesa della SS. Trinità in Via Condotti. The aim of the Trinitarian Order was to ransom Christian slaves. 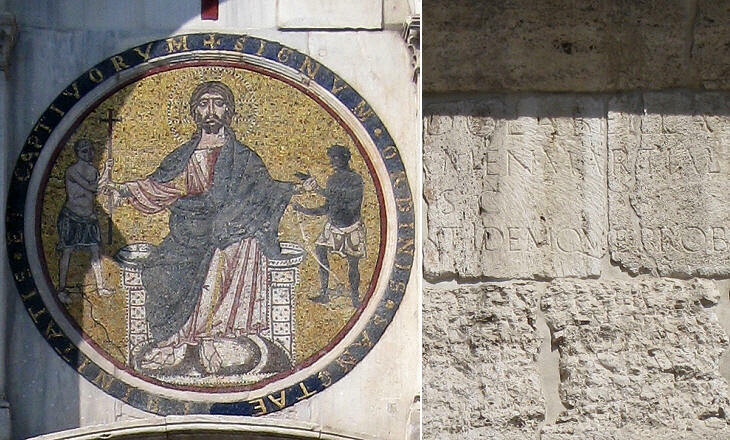 The mosaic shows Jesus Christ in Majesty between a white and a black slave; the inscription says the image was the symbol of the order (Signum Ordinis Sanctae Trinitatis et Captivorum). The ancient inscription mentioned by Vasi in the plate celebrates the erection of an arch (most likely a gate of the old Republican walls) by the consuls Publius Cornelius Dolabella the Younger and Gaius Junius Silanus in 10 AD, at the time of Emperor Tiberius, whom however is not mentioned in the inscription. Eventually the arch became part of the aqueduct. The street under Arco di Dolabella leads to SS. Giovanni e Paolo. The small medieval church of S. Tommaso in formis stands at its beginning, immediately after the arch. In the old times it could be accessed from the hospital. In formis is a corruption of in fornices which means in the arches. Its interior was almost entirely modified in the XVIIth century. The gigantic pillar shown in the plate belonged to the aqueduct built by Emperor Nero to bring water to his palace on the Palatine; because it was a branch of the aqueduct built by Emperor Claudius a few years before, Vasi calls it Acqua Claudia (another stretch of the aqueduct can be seen near Porta Maggiore). St. John of Matha, the founder of the Trinitarian Order lived from 1209 until his death in 1213 in two narrow rooms which were nested inside the aqueduct pillars above Arco di Dolabella. The current entrance to Villa Mattei is not that shown in the plate. 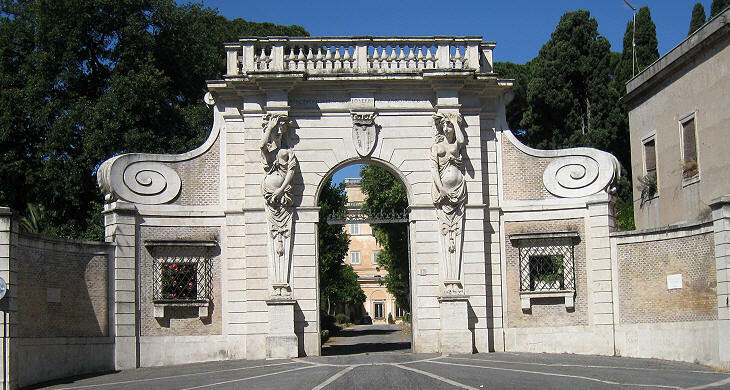 It is the former main entrance to Villa Giustiniani and it was moved to this site in the 1920s when Villa Mattei was bought by the State and opened to the public. This entrance dates back to the early XVIIth century and it was designed by Carlo Lambardi. 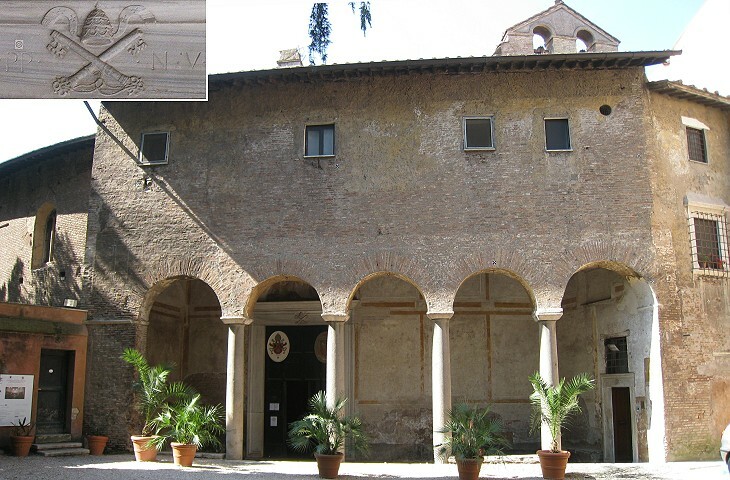 The Villa is also called Celimontana with reference to its location on the Caelian Hill (Mons Celius). This large round church was founded by Pope Simplicius in ca 468 by making use of materials from previous buildings existing in the neighbourhood (most likely Macellum Magnum, a covered market built by Emperor Nero). Its shape was perhaps inspired by the round section of the Holy Sepulchre in Jerusalem. It had two circular rows of columns. The church was completed in the VIth century by Pope Felix IV. 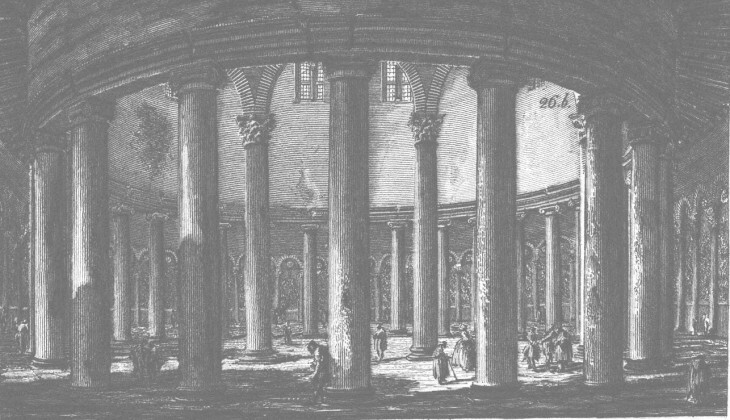 In the XIIth century Pope Innocent II strengthened the building by erecting two central very high columns to support the roof. According to chronicles of the XVth century the roof had fallen and the whole building was about to collapse. In 1453 Pope Nicholas V repaired the church and reduced its size by leaving out the outer ring with the exception of a small part of it which was turned into a portico. 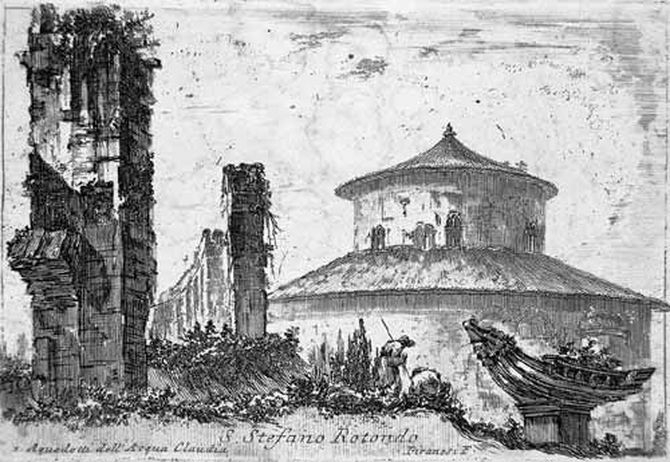 You may wish to see S. Stefano Rotondo as it appeared in a 1588 Guide to Rome (the drawing does not care about perspective laws, but it helps understand the overall shape of the building) and S. Costanza, another ancient round church. 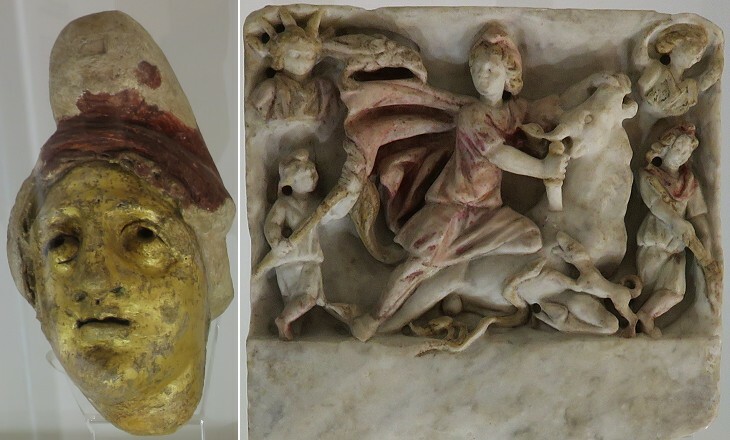 Recent excavations under the church found evidence of a mithraeum, a long and narrow hall where the worshippers of Mithras gathered for ceremonies. It was most likely built for the soldiers of Castra Peregrina, a nearby barracks which housed a sort of secret police. Many mithraea have been found in Rome (e.g. at S. Prisca and at Palazzo Barberini) and in particular at Ostia. A relief related to the worship of other eastern deities was found at Castra Equitum, another barracks not very far away. 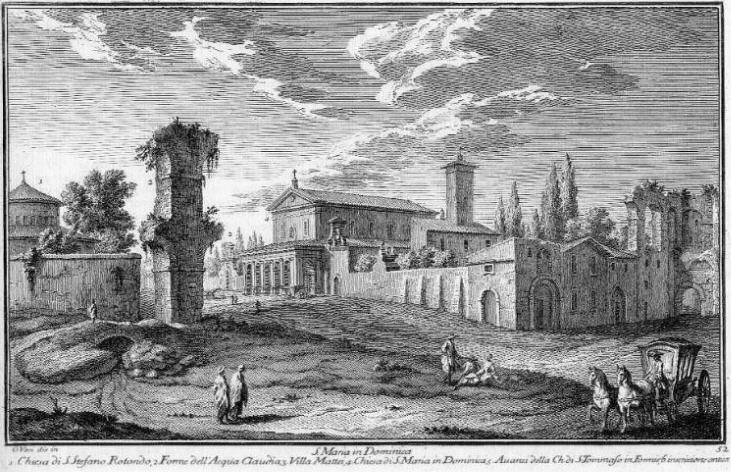 Because the church was thought to be a former monument of Ancient Rome, it attracted the interest of many Grand Tour travellers and Giovanni Battista Piranesi engraved two views of S. Stefano Rotondo which showed its exterior (it opens in another window) and its interior. 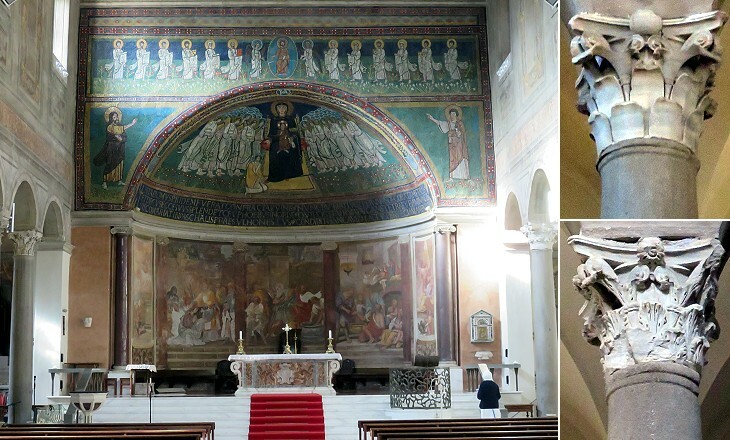 The church has always suffered from humidity problems which have damaged its frescoes: a lengthy and careful restoration of the roof and of the interior was completed in 2009. It also eliminated additional altars and other material which impaired the view of the building structure. The church was dedicated to St. Stephen the Protomartyr, the first Christian martyr, but it did not have a relic of him. According to tradition the body of the saint was moved from Jerusalem to Damascus, to Constantinople and eventually to Rome where Pope Pelagius II placed it next to that of St. Lawrence in Basilica di S. Lorenzo fuori le mura. This shortcoming of S. Stefano Rotondo was overcome in ca 640 when Pope Theodore I decided to move there the relics of Sts. 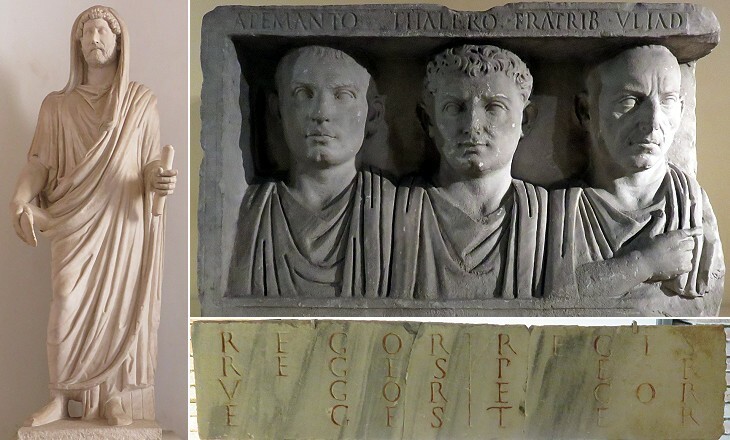 Primus and Felician (late IIIrd century martyrs) from their burial site near today's Mentana. Pope Theodore I built an additional chapel to house the relics of the two saints and we can assume that its end wall was entirely decorated with mosaics. In the XVIth century only the mosaic of the small apse was in condition good enough to be repaired (some parts of it are painted). The two saints were portrayed wearing the tablion, a lozenge shaped coloured panel across the chest, which was worn by the Byzantine emperors and their closest advisers (at that time Rome was part of the Byzantine Empire). You may wish to see a mosaic portraying Emperor Justinian with the tablion at S. Vitale in Ravenna. 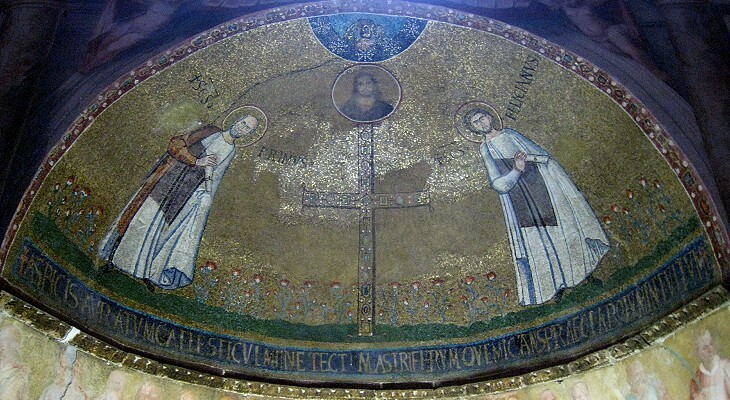 Pope Theodore also promoted the decoration of a chapel of Battisterio Lateranense. In 1583 Pope Gregory XIII commissioned a series of frescoes which portrayed the death of the Apostles and of some early martyrs. 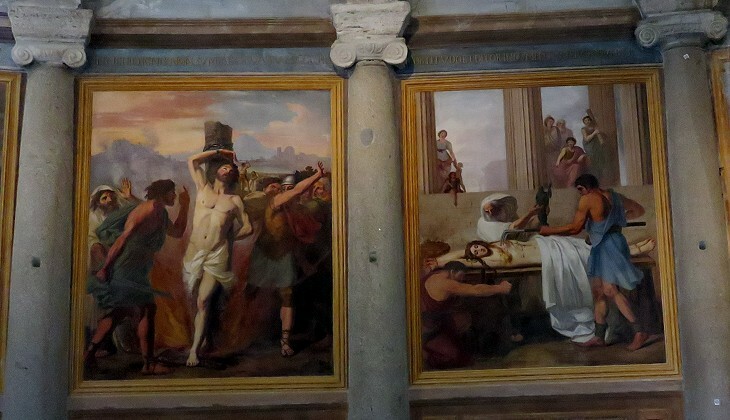 They were the first of a long series of paintings having as subject torture and death scenes. 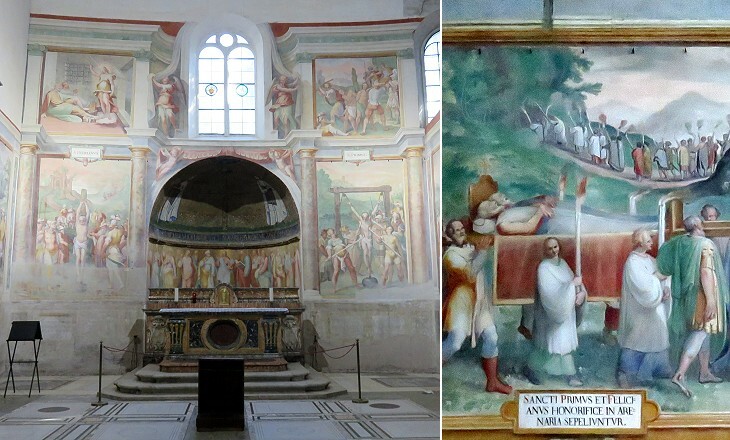 These (paintings) represent the martyrdoms of saints and early Christians; and such a panorama of horror and butchery no man could imagine in his sleep, though he were to eat a whole pig raw, for supper. You may wish to read more of what Charles Dickens thought of these paintings. 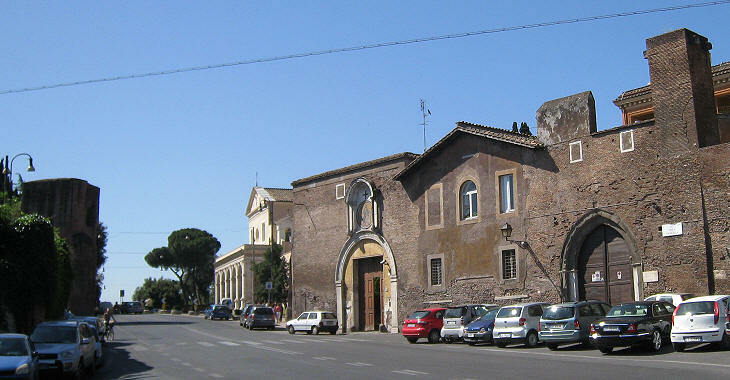 Cardinal Antonio Casali gathered a collection of antiquities in his family villa opposite S. Stefano Rotondo and in a farm near Porta S. Sebastiano. The Casali were not very rich, but Cardinal Antonio was passionate about archaeological excavations. In 1772 he found an interesting altar near SS. Quattro Coronati: he chose to donate it to Pope Clement XIV and the altar is usually named after him. It was made in the IInd or IIIrd century AD and its front shows the name of the donor inside a wreath, Apollo and Vulcan above it and Mars and Venus in love below it. Its sides are decorated with stories of the War of Troy or of the Foundation of Rome. You may wish to see a similar, but finer altar at Ostia. Next plate in Book 3: SS. Giovanni e Paolo. Next step in Day 1 itinerary: SS. Giovanni e Paolo. Next step in your tour of Rione Monti: Spedale di S. Giovanni in Laterano. 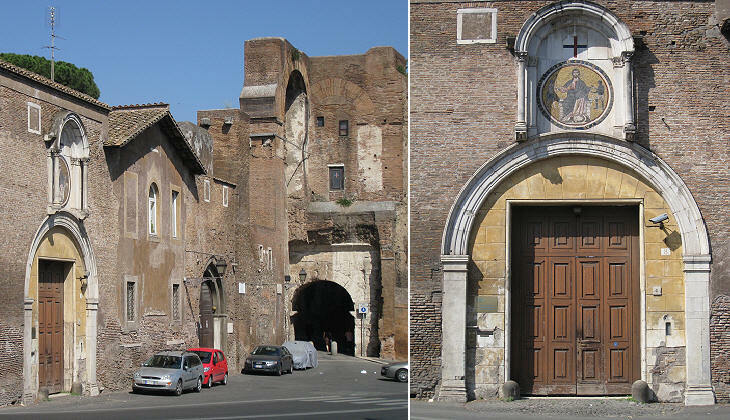 Next step in your tour of Rione Campitelli: Porta Latina. Nel più alto sito del monte Celio, ove furono gli alloggiamenti de' soldati pellegrini, siede questa chiesa, detta dalli Scrittori ecclesiastici in Domnica o in Ciriaca da quella Matrona romana, che come diremo fra poco, dette sepoltura a s. Lorenzo, la quale quì aveva una casa, che fu consagrata in chiesa, e secondo alcuni, fu diaconia del santo Martire Fu rifatta da Pasquale I., e poi da Leone X. con disegno di Raffaelle da Urbino, e vi dipinsero il fregio Giulio Romano, e Pierin del Vaga, ma ora tutto è andato male: e per quella piccola nave di marmo, che sta innanzi la chiesa, si dice alla navicella. A sinistra di questa, appunto incontro alla via, che va verso il Colosseo, si vede la nobilissima porta dell'antichissima chiesa di san Tommaso in Formis. fatta di marmi, e mosaici da s. Gio: di Mata fondatore dell'Ordine del riscatto delli schiavi, nella quale egli morì, e per molto tempo vi stette il di lui corpo: ma poi essendo abbandonata da quei frati, fu ridotta in commenda, e dipoi unita al Capitolo di s. Pietro da Bonifazio IX. l'anno 1395. Si conserva però la memoria della chiesa sotto l'arco, che si trapassa, in una piccola cappella, ove il.giorno del s. Apostolo viene ad ufiziare il suddetto Capitolo. Si disse in formis per le forme, o archi dell'acquedotto dell'acqua Claudia, che rovinate vi si vedono.